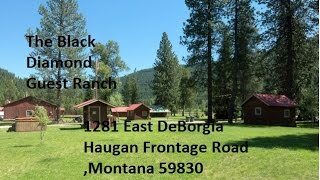 Looking for the Best Kept Secret in Montana? Our Cabin 5 is it! This vacation rental in Montana (sleeps 4) and has a propane cook stove. Sleeping arrangement: 1 queen on main level + 2 twins in the loft. If your group grows to 17 people, rent one of our other 4 cabins or the Bunkhouse! Everyone’s still together at one ranch! Ask us about community events, festivals, golf courses and unique shopping in quaint nearby historically rich towns. Local exploring is a big part of your Montana cabin time! Our Black Diamond Guest Ranch is full of surprises: Stay at rustic cabins, try tent camping (glamping), or take advantage of full hookup or self-contained RV accommodations. Board your horse! Outside corrals and inside barn horse stalls are available. Do chuckwagon barbecues and cookouts sound like fun? Your group can enjoy cookout you’ll never forget - barbecue pit holds about 200 lbs. of ribs and chicken. The central Lodge has dining, eating and gathering space (Full Commercial Kitchen). Bathroom and shower facilities are available. Stone fireplace, sofas for relaxing and reading, pool table, board games. Lodge seats approximately 80 people on Ranch designed-custom pine tables and there is more outdoor seating on picnic tables. Because you book directly with us, we can custom design your visit to suit your party: ski packages at nearby Lookout Ski Lodge, anniversaries, family reunions. Get ready for a true sense of Rocky Mountain living adventures. Roam on our 40 acre ranch - or explore 1200+ square miles of mountain forest and river valley. 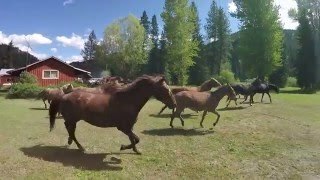 Our ranch borders the Lolo National Forest. Many ranch guests go horseback riding; try some fishing or rafting on the Clark Fork Rivers; Bicycle the historic and awe-inspiring Hiawatha bile trail with its cool railroad tunnels. Of course, great hunting and fishing too. Fishing tip! Anglers particularly enjoy the St. Regis River. The world-renowned Alberton Gorge draws those who want to white water rafting experience, Bring your kayak or canoe for a Clark Fork River trip. Rent snowmobiles and hit the trails right from the Ranch Bunkhouse! Snowshoe hundreds of miles of trails. We have plenty of room to spread out and enjoy our Montana outdoors. Rent the entire bunkhouse (sleeps 17) for $250/nt. Bring-your-own tent for rough camping $25.00 per tent. Note - The lodge can be rented with or without the commercial kitchen, which can be rented separately, and as an additional charge. All prices: Plus 7% lodging tax and 3% credit card fee. Holidays are two night minimum. Required deposits and credit card information required to confirm reservation. For cabin reservations, $25.00 non-refundable deposit is required. 24-hour written cancellation notice required acknowledged by BDGR. For all reservations in excess of $1,000.00, a 50% deposit is required AND a 15-day written cancellation notice is required and acknowledgement by BDGR is required; otherwise, any deposit on file is forfeited. Guaranteed late arrival honored for first night’s stay. Credit card will be charged for no-shows. Special pricing is available if you rent the entire facility. We like to think that our ranch is the “Best Kept Secret” in Montana! Please contact us with your group details. We will be happy to answer any questions you may have so you, your friends or family will have the best possible visit to Montana. The lawn surrounding our ranch has commercial barbecue pit and picnic tables. Our staff can custom design your visit to suit your needs for memorable outfitting adventures from weddings, anniversaries, family reunions, scouting, to church activities. I’m James Beall, the proud owner of the Black Diamond Ranch which has been in operation for over 70 years. We serve guests from all over the world and we have a large repeat customer base from both local and out-of-state anglers, hunters and wilderness enthusiasts. Ask about special pricing when you rent the entire facility. Thank you!